You got another chance to stock up on you favorite TheSauceLA e-liquid. 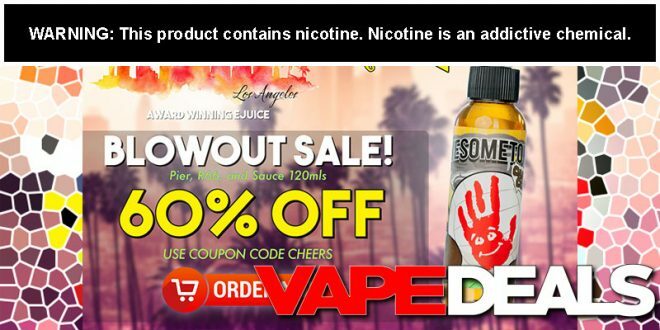 Use the coupon code “Cheers” at checkout and you’ll save 60% off your purchase of the following e-liquid lines: Route 66, The Pier, The Sauce and Awesometown ejuice. Plus, all orders $39.99 or more (after discounts) will also get FREE SHIPPING included. And, just to throw in a little spice to this sale… you can pick up a 60mL bottle of Castaway Coconut for just $2.99. Just use the same coupon code “Cheers”.